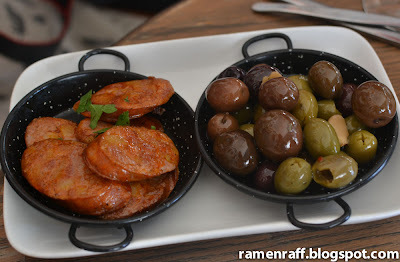 Late 2011 and beginning of 2012 has brought Sydney new cafes and restaurants for us to explore. Choosing between which joint to try first becomes a difficult decision. As some of you know, I am going through a Malaysian cuisine phase. A recommendation from a trusted source made the decision making process a breeze! The chosen one was Petaling Street Malaysian Hawker food. It is one of those new-ish restaurants I have enjoyed dining in since the beginning of this year. 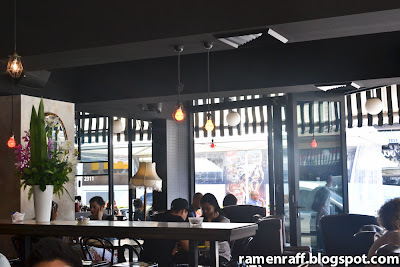 As the name suggests, they serve hawker style Malaysian cuisine. Petaling Street Malaysian Hawker food restaurant is located along George Street (near the Capitol Theatre) in Haymarket. It is named after a popular place in Malaysia (which also holds the same name, "Petaling Street") that accommodates to dozens of food stalls and restaurants. Petaling Street sets a very clean looking hawker style environment with wooden chairs and benches. The level of lighting makes this place very warm and inviting. I really like restaurants with nice lighting as I also want to enjoy food visually. 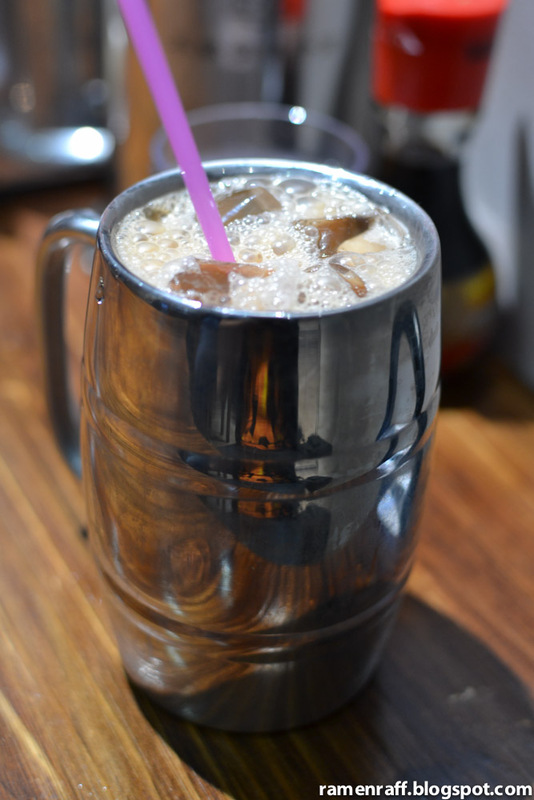 Iced teh tarik ($3.50). 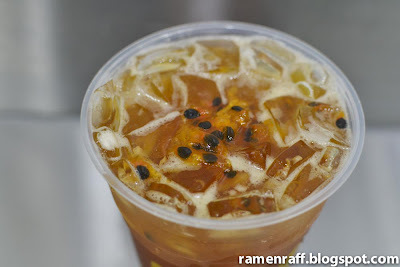 They make this classic Malaysian drink quite well. 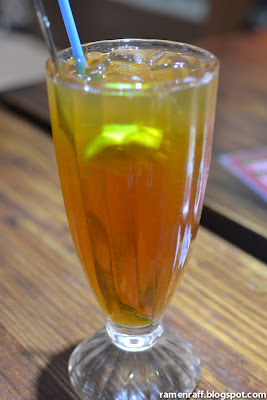 For those not familiar with this drink, it is the iced version of "pulled tea". A mixture of black tea and condensed milk. The pulling preparation process gives the drink it's frothy top. 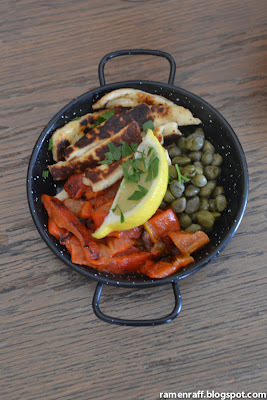 I would definitely order it again on my next visit. 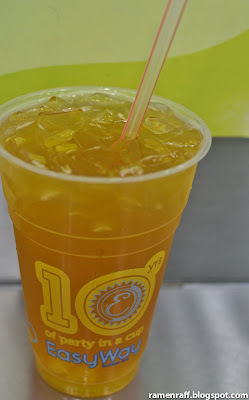 Teh O Ice Limau (Iced lime tea) ($3.59). 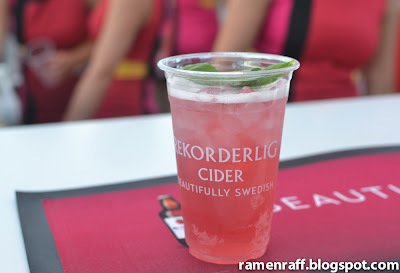 Very refreshing and not too sweet! 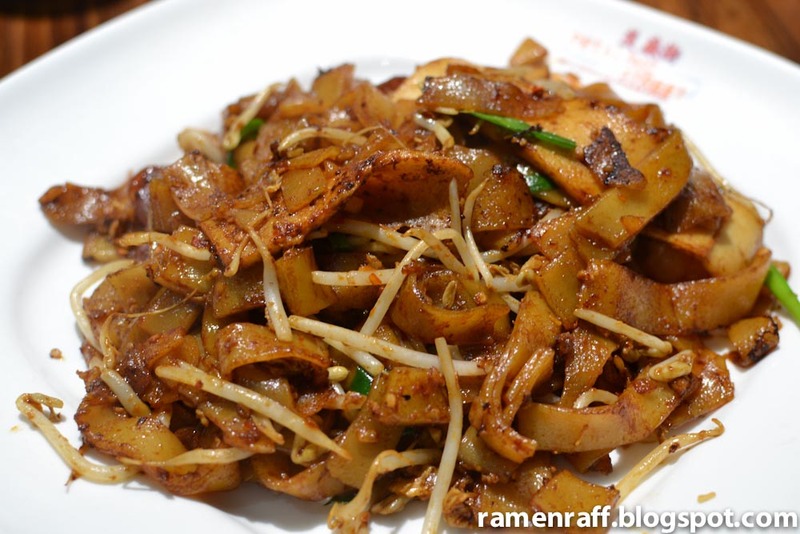 Their fried or char koay teow (CKT) ($9.50) is probably my favourite out of the whole menu! Maybe even my favourite CKT in Sydney. It is amazing! Everything I like in a CKT is in it - Stir fried egg noodles with chinese sausage, prawns, bean shoots and it even has clams! I heard clams in CKT is how it's done in Malaysia. 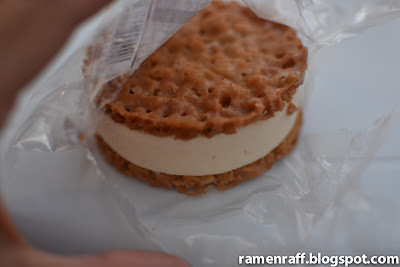 The caramelised sweet soya and "breath of wok" taste is present in this version. It has the perfect amount of spiciness in it. Petaling Street style rice drop noodles in claypot ($11.50). The texture of the noodles is slightly chewy. 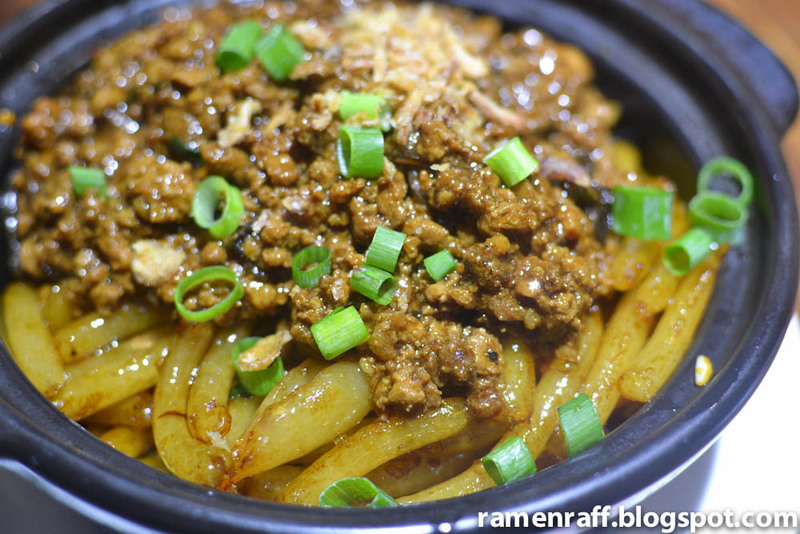 Topped with mince pork which has a cross flavour of kecap manis and oyster sauce that is slightly peppery. It is quite greasy. But in actual fact, the greasiness makes this dish taste better! The Chinese mushroom adds a nice touch to the dish and also serves as a flavour carrier. 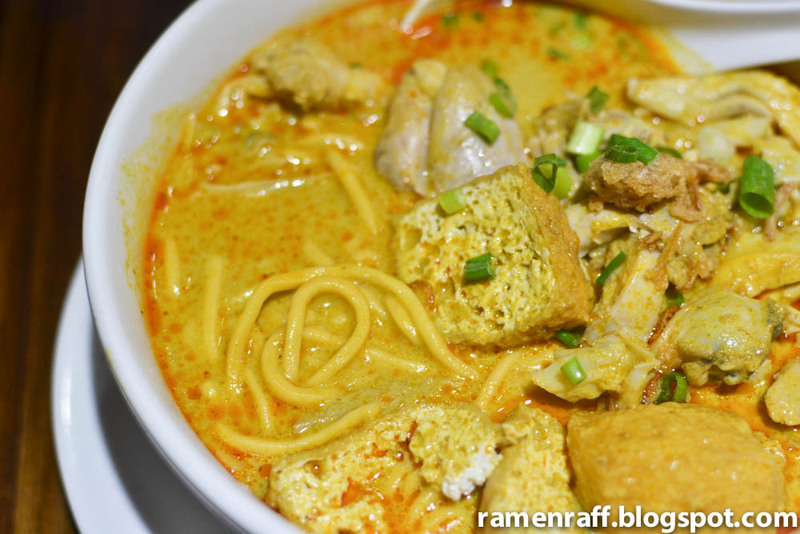 Last but not least, the chicken curry laksa ($ 9.90) is so good! 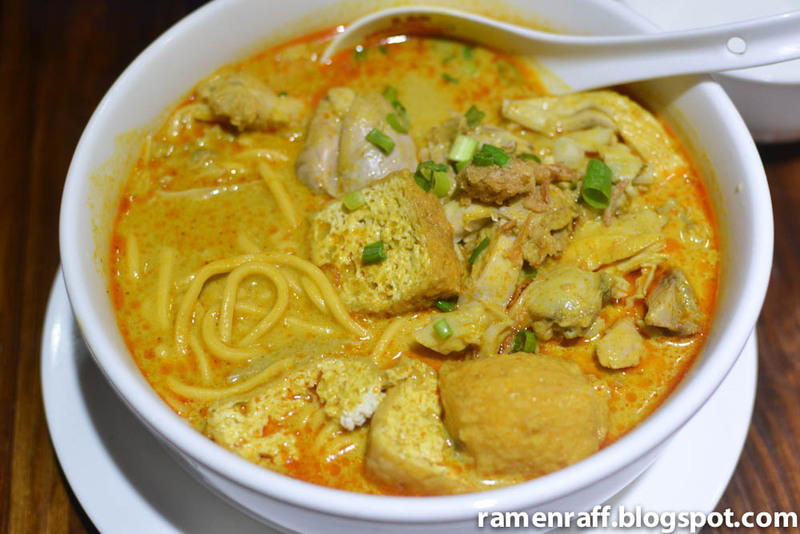 It has the usual mix of egg and vermicelli noodles. Also contains chicken, bean curd, bean shoots and tasty clams. The broth is milkier than what I'm used to. It is spicy but not too hot to handle. Overall, a very nice bowl of laksa! 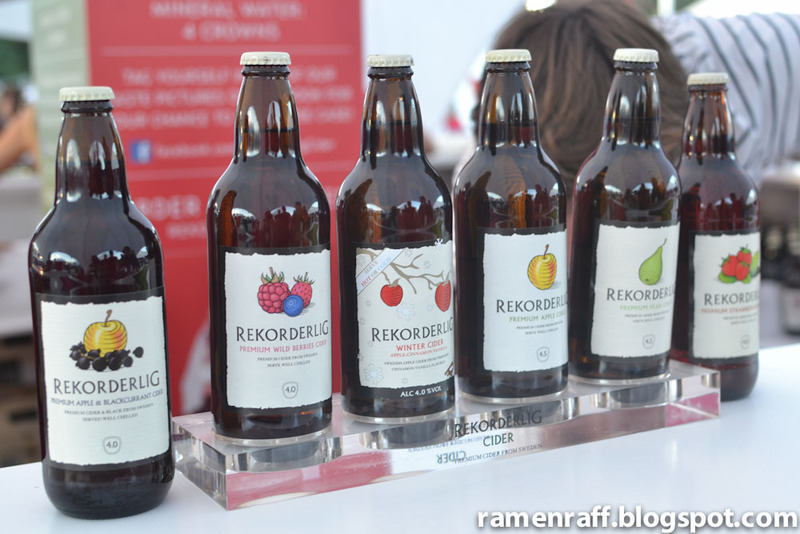 This is a new kid on the block worth visiting. 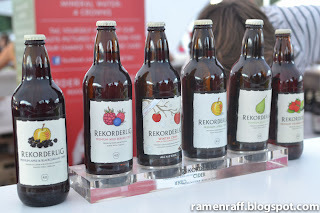 Good value plus good tasting food with generous servings is a winner for me! The food at Petaling Street was very yummy for my tummy! 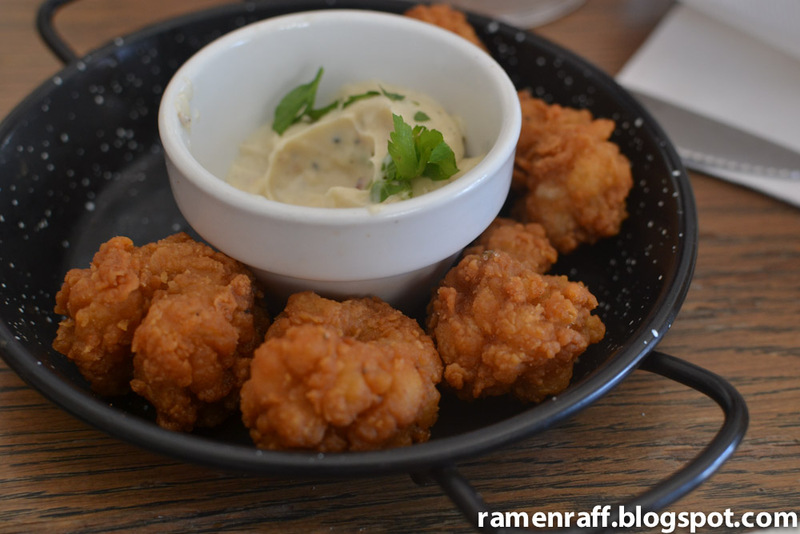 Do you ever wonder what some of Sydney's amazing restaurants have to offer? 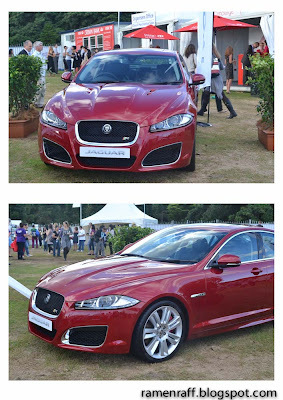 But then, unsure whether it's worth the visit? 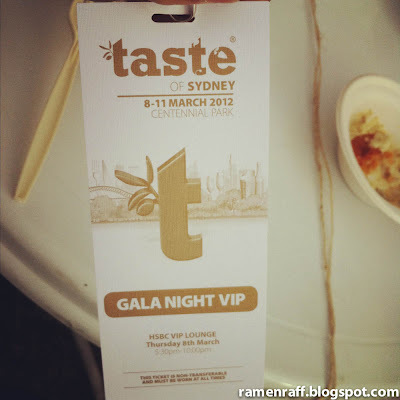 Taste of Sydney is the answer! 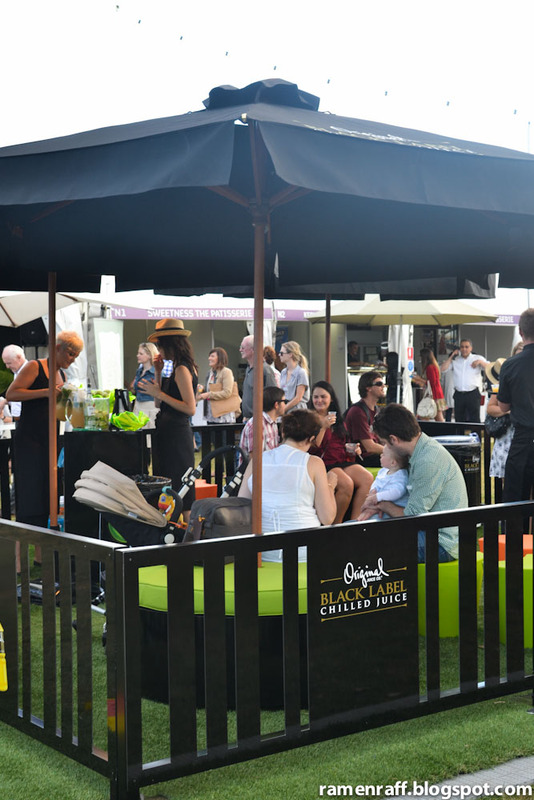 Taste of Sydney is a yearly event dedicated to presenting some of Sydney's prestige restaurants. 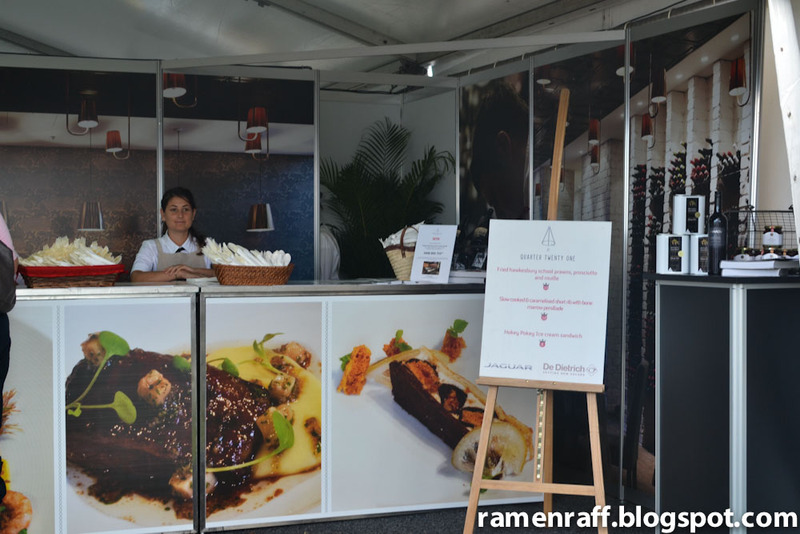 The restaurants involve gets the chance to showcase their dishes to the public. 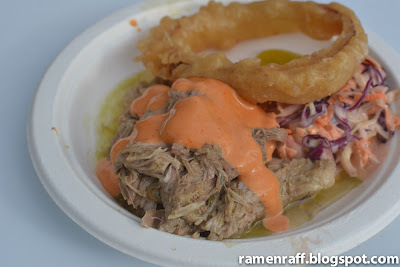 The items offered at the event are all sampling sized dishes worth mostly around 8-12 crowns. Crown is the official currency at Taste of Sydney (1 crown = $1). Some dishes that are referred to as "icon dish" were worth around 20-32 crowns. A week has passed since a league of food loving people and I had our Taste of Sydney experience. But memories of good food still linger in my mind. I could almost still taste them all! What was even epic about my visit to the event, is that we scored a V.I.P. pass! Thanks to the Stellar* Concepts and Simon of "The Heart Of Food"! Besides entry to the event, the pass gave us access to the HSBC lounge where celebrity chefs were chillin'. 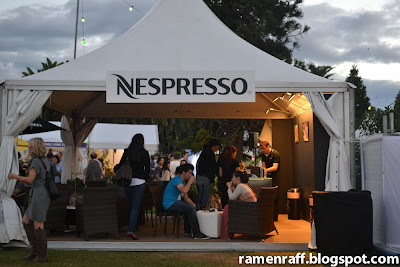 There was an amazing band playing and awesome espresso drinks were free. Yes, I did have a huge smile in my face as I was typing all of that. 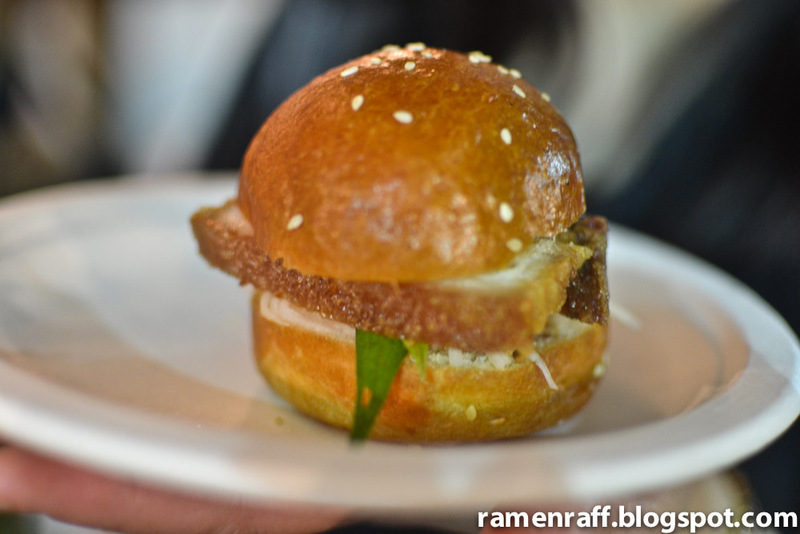 The Crispy Pork Belly, Pickled Daikon and Chilli Jam in a Sweet Roll (10 crowns) was one of my favourite dishes. 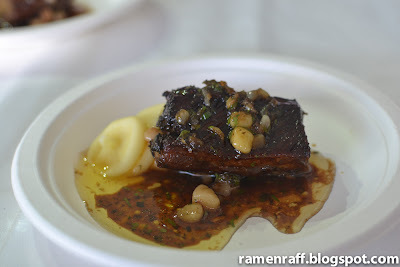 The pickled daikon and chilli jam compliments the delicious pork belly well. Another favourite of mine (and of the group) is the Slow Cooked and Caramelised Short Rib with Bone Marrow Persillade (12 crowns). 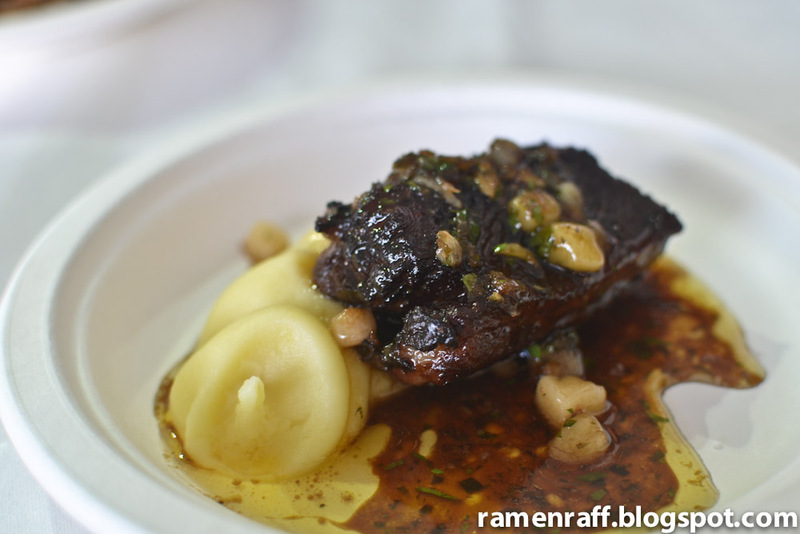 Super tender short rib has a good balance of caramelised sweet, salty and tangy flavours. 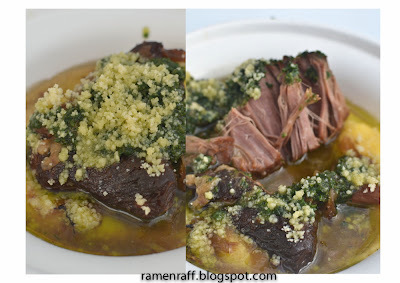 The Braised Shoulder of Lamb with Polenta and Green Sauce (12 crowns) is very tender that was quite easy to pull apart. 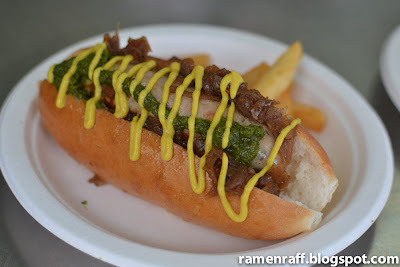 It has a green sauce that is exquisite. Crisp Brisket of Pasture Fed Beef with Creamed Wild Mushrooms (10 crowns). 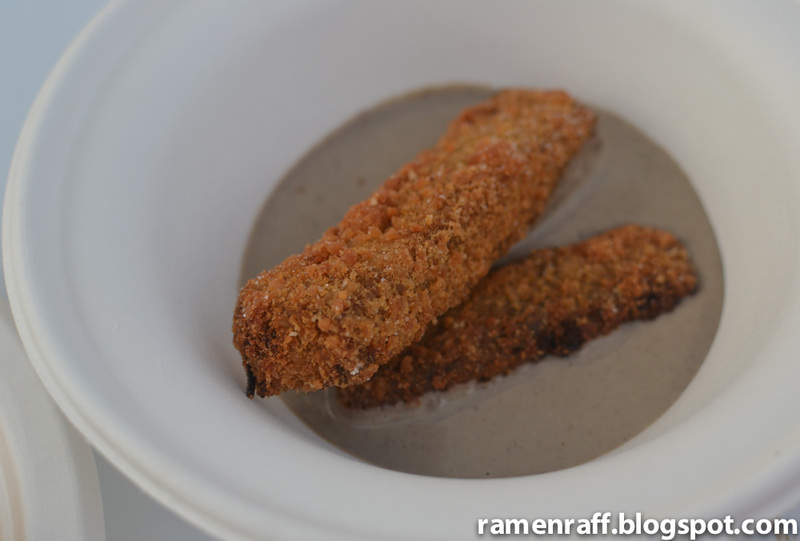 The creamed wild mushrooms is the star in this dish. It tasted a bit like truffle in cream sauce. 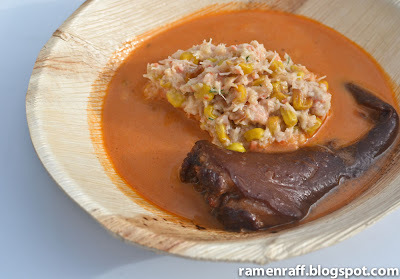 The light earthy flavour in the sauce is what I like most in this dish. The Dog Miniature artisan frankfurter (8 crowns). 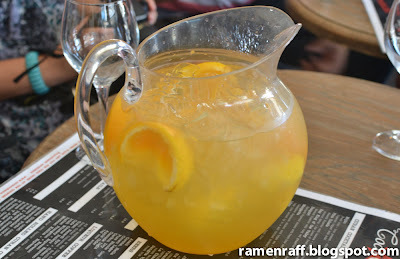 I like it so much that I will definitely order this again on my next Charlie and Co. visit. 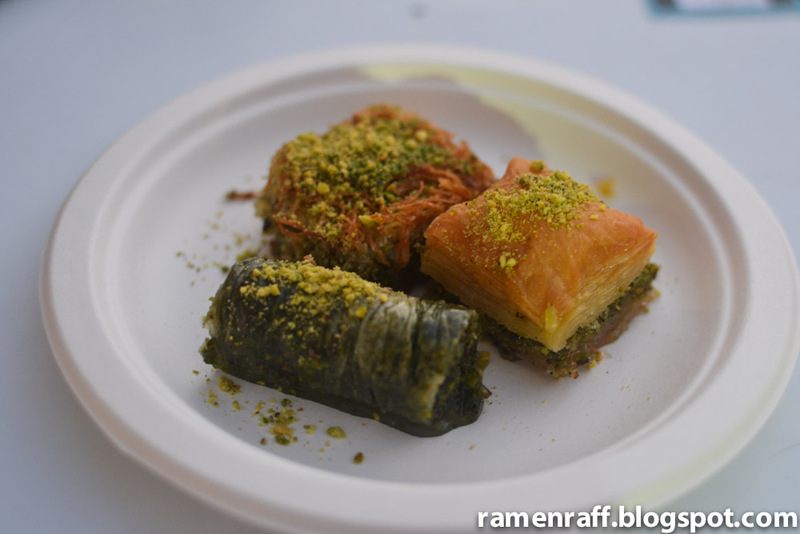 Pistachio dessert trio of traditional Baklava, Dolma and Kadayif (8 crowns). 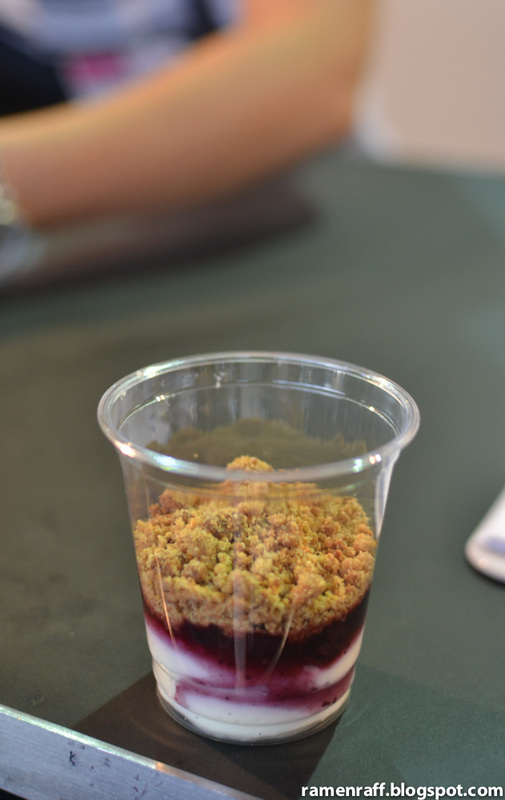 Deconstructed Vanilla and Blueberry Cheesecake with Chestnut Crumble (8 crowns). 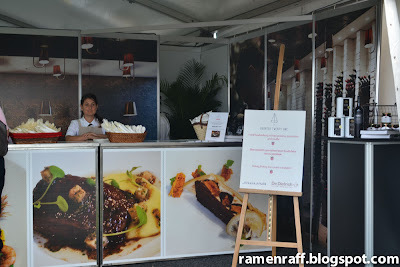 Aside from restaurants, there were also a line-up of artisan producers and boutique suppliers. We had the pleasure of sampling their products too. Pat and Stick's ice cream sandwiches (6 crowns per ice cream sandwich). I've always adored their ice cream sandwiches especially their vanilla lace and caramel pecan ice cream sandwiches. 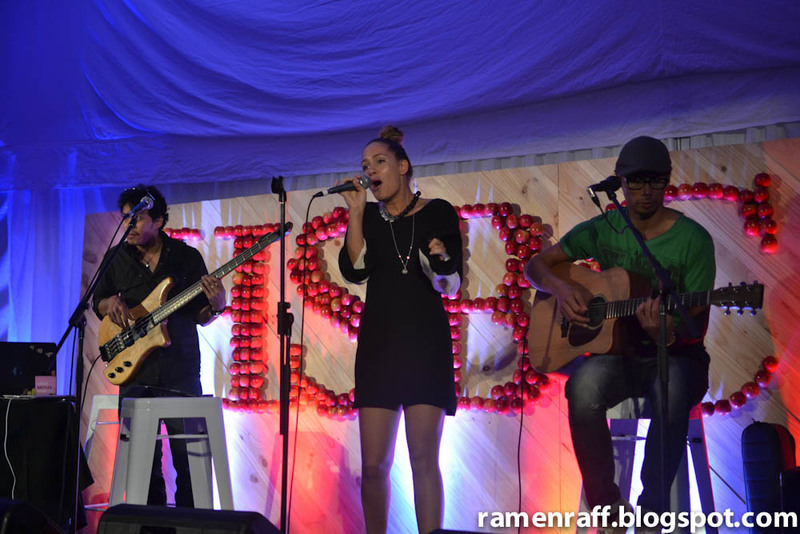 When I saw them at the event, I couldn't resist the urge of devouring a sandwich or two! 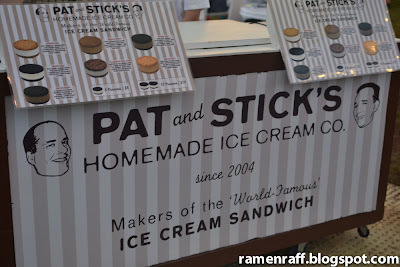 Mr "The Heart Of Food" with his powers of persuasion, tricked me into trying Pat and Stick's new Hot Chocolate. It is said that it has a hot and spicy kick. 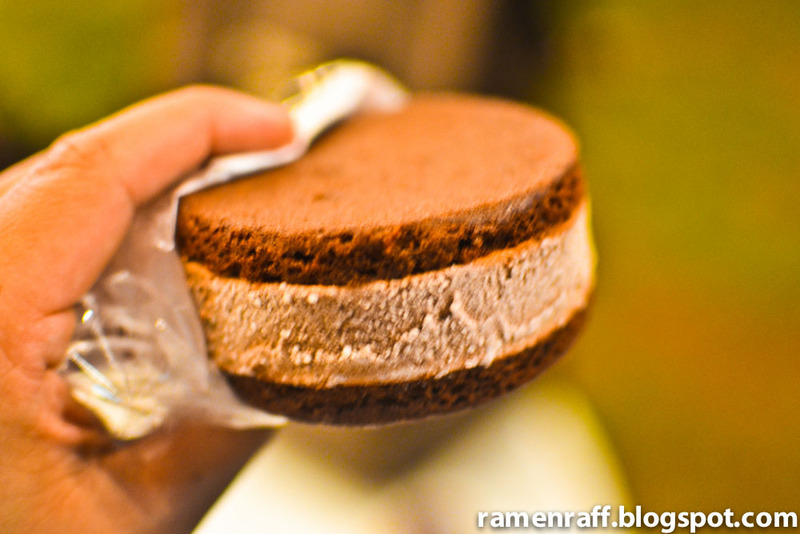 As I took a bite, it just tasted like a very nice chocolate ice cream. But towards, that's when the party really starts! Oh yeah! It was hot and spicy alright! So, be on the look out for Taste of Sydney next year. This is one food event a food loving human being wouldn't want to miss! What makes anyone or anything stand out the most in today's society? Hundreds of things are potential answers to this question. For me, it's making a positive difference/impact on peoples lives that makes someone distinct. That's something that I discovered about Coco Cubano one Sunday afternoon. 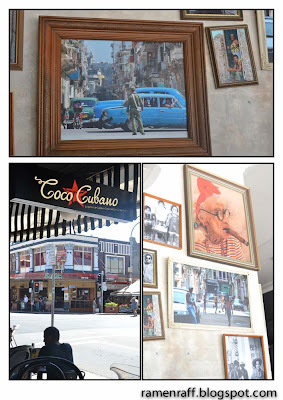 Coco Cubano is located on the food strip area of Church Street, Parramatta. 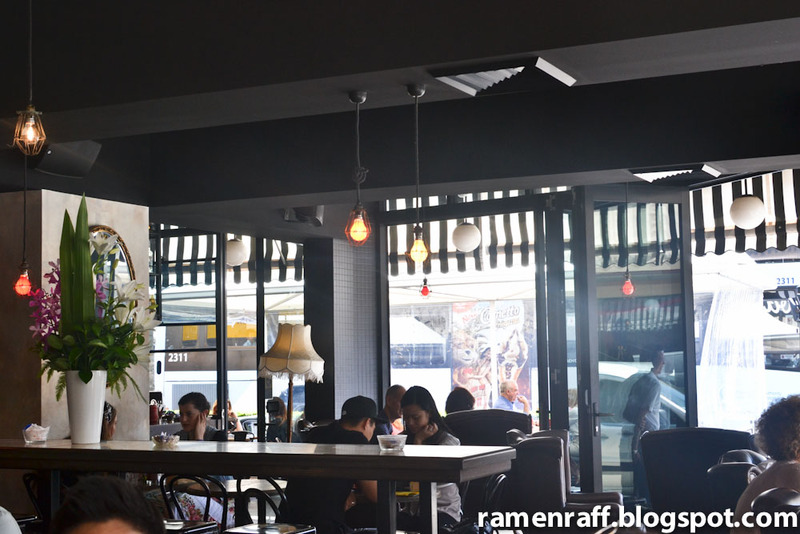 It is a very sleek looking cafe with a laid back vibe. 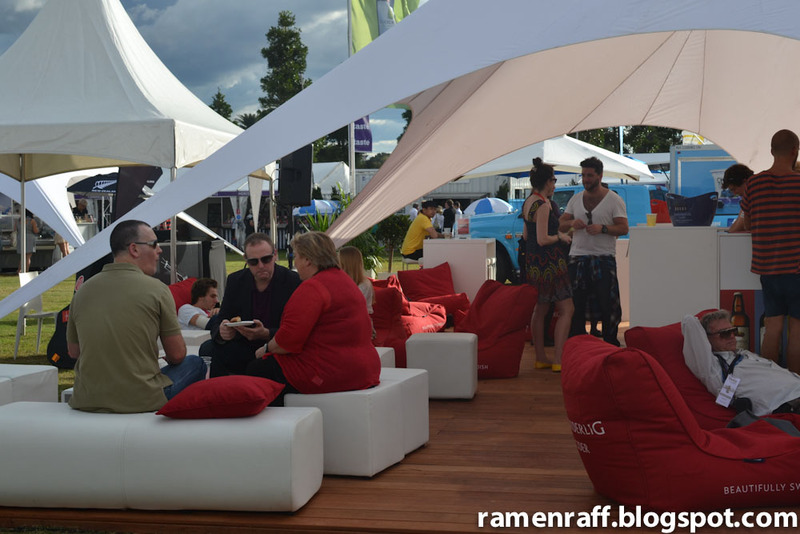 It is the perfect place to chillout and hangout. 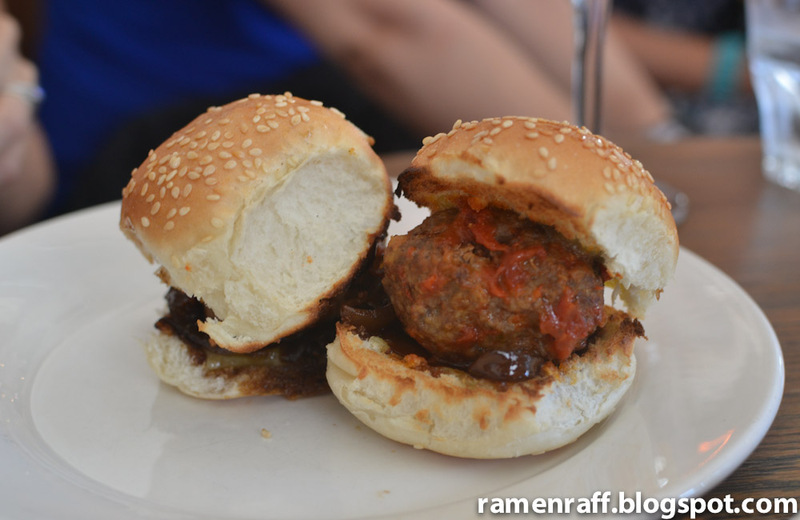 A few fellow Western Sydney food bloggers and I had a meet-up lunch courtesy of Coco Cubano. As we were enjoying the awesome food and drinks, the El Presidente of Coco Cubano, Tony, took us through the history of their business. 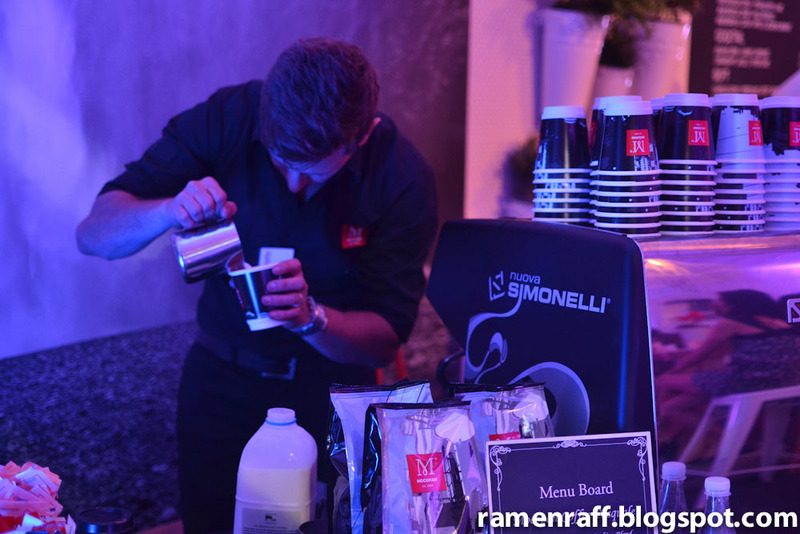 According to him, it was a trip to Cuba that inspired him to start Coco Cubano. The cuisine behind the food and drinks at this cafe/bar/restaurant is not exactly Cuban. But it's the revolution that Cuba's gone through that stands as the driving concept behind the food and service. 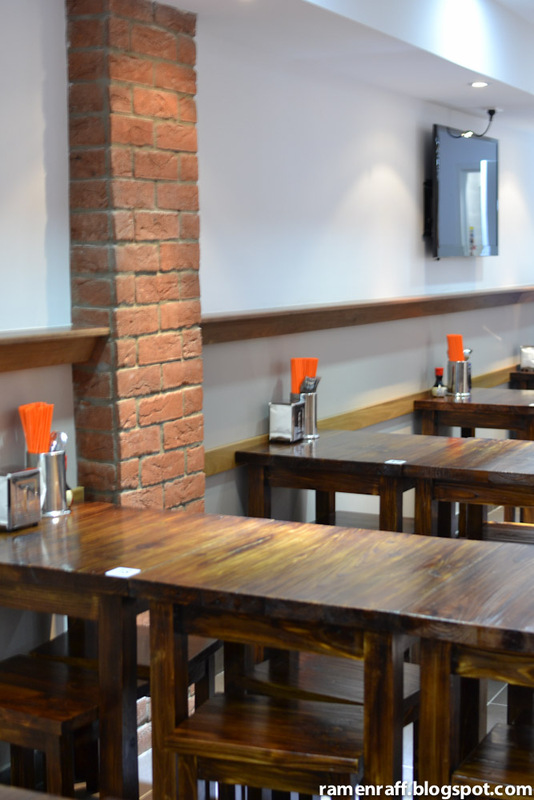 The concept of revolutionising people's lives touched by Coco Cubano's food and hospitality with passion. It's through their wide range of scrumptious dishes that they are making a positive impact in the community. The iced mocha was rich with a dominant chocolate taste. The espresso kicks in towards the end of the sip. The white sangria was a group favourite. 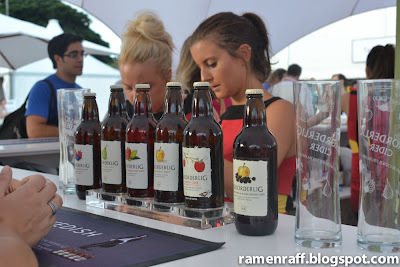 It is very refreshing and citrus with a subtle alcohol after taste. My jaw dropped when I saw vegetarian nachos ($12.90). 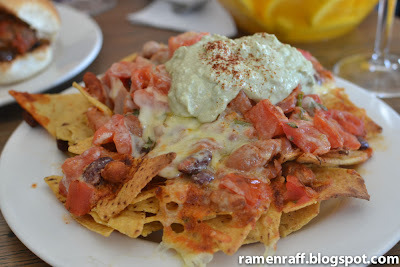 The nachos had generous amounts of salsa, guac, beans and cream. It's the kind of food that makes one happy even just looking at it. Munching on it was very comforting and satisfying to my tastebuds. The calamari with garlic salt and roasted garlic sauce ($12.90) had a thick crunchy batter. It's succulent and I love it! 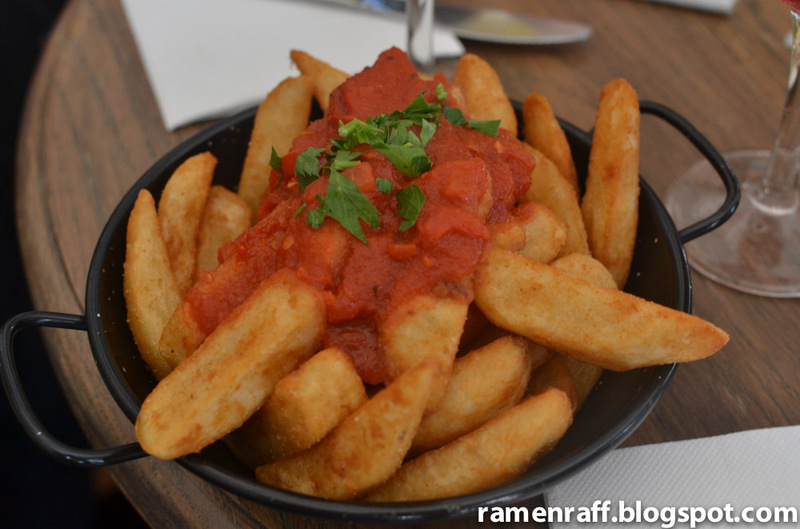 The patatas bravas ($9.90) looked more like chunky chips with a very nice tomato sauce with light garlic taste. The potato had a lightly crisp surface and is very soft inside. They also have beef burger sliders ($9.90 for 2), which was my favourite! The thick mini pattie was very juicy, flavourful and perfectly cooked. 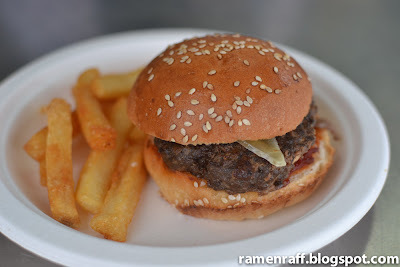 The sweet onion jam made the slider extra special adding a little bit of sweet taste to the slider. 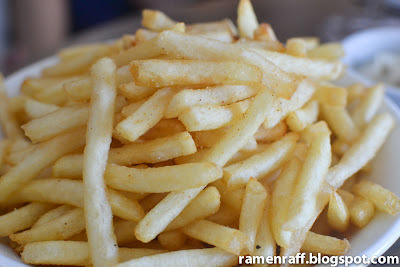 The bowl of fries with chili salt ($7.90) was very addictive. Fries were perfectly cooked just the way I want it. Unfortunately, I didn't get to stay long enough to try out the desserts. To see and read about the desserts the group had, check out Chocolatesuze's post here. So what make's Coco Cubano stand out and distinct amongst other cafe/restaurants in Parramatta? It's the ethics of passion & revolution that is evident in their food and hospitality. Thanks Chocolatesuze and Tony for organising this awesome meet up! Ramen Raff dined as a guest of Coco Cubano. Summer is gone (well, it didn't feel like we had one anyway) and now, we've entered the autumn zone. We will soon see less of singlets and shorts as the season draws closer to winter. 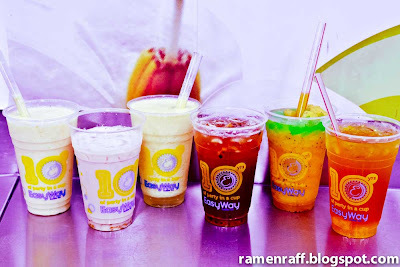 Clothing may go out of fashion at some point, but fruits and milk tea will not! 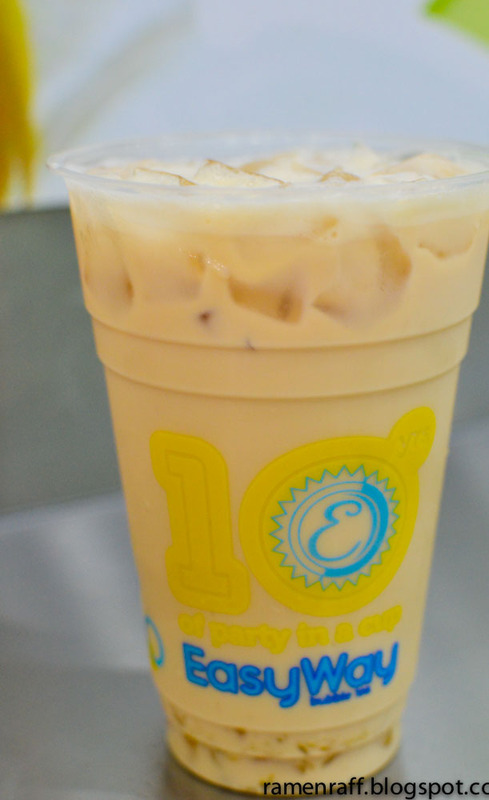 In my opinion, EasyWay's milk teas and shakes are soothing refreshments all year round. Easy Way has yet again taken innovative steps to bring us a range of new & enticing drinks to cater to a wide range of taste buds. We now enter "The Fruit Pulp Party II" zone. 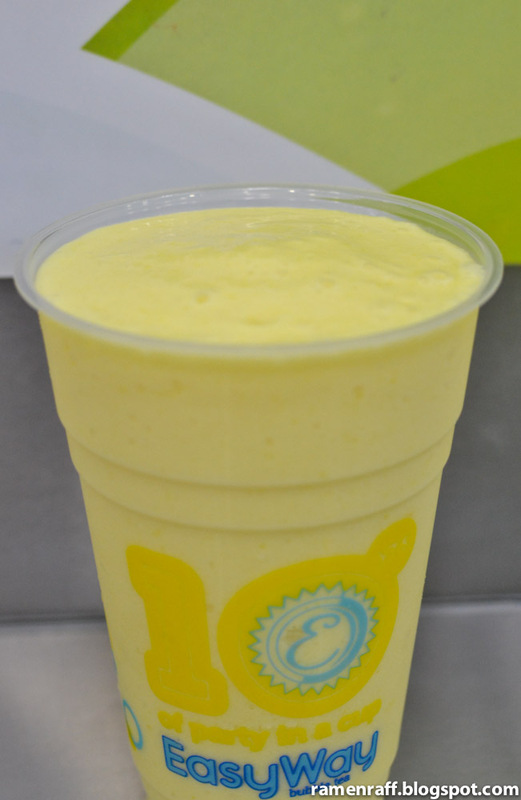 Adding pineapple, mango or passionfruit to your favourite bases such as milk teas, iced black/green tea, shakes etc. 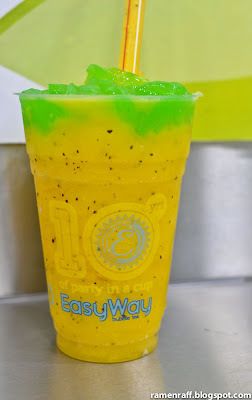 takes classic EasyWay drinks to another level of refreshing taste. Mango pulp milk tea - It tastes like a normal milk tea for a second or two. But as soon as the mango pulps follows, it turns the milk tea into a more tropical type blend. The pulps are a sweeter alternative to pearls. Passion fruit pulp black tea - it is lightly sweetened and a little bit sour. 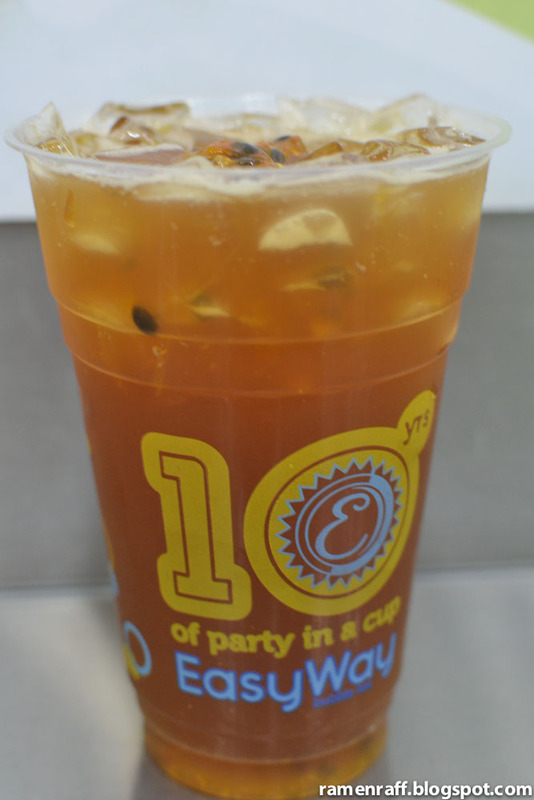 The passionfruit taste in the drink is a little bit more dominant than the black tea flavour. Pineapple milkshake - it tastes like piña colada minus the alcohol after taste. 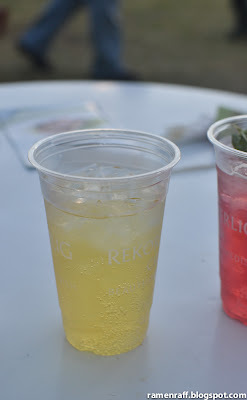 Pineapple pulp green tea - lightly sweetened with a strong green tea taste. 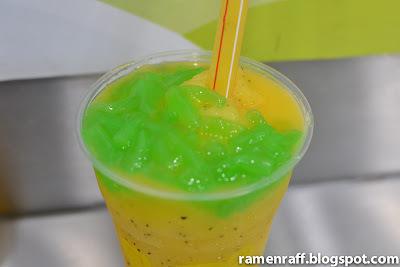 The pulp adds a nice texture & extra fruity sweetness to the drink. Passionfruit pulp frappe (extra green apple jelly optional) – I love the after taste. I recommend adding green apple jelly to this drink. 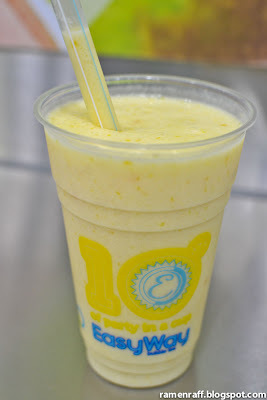 Mango pulp milkshake - It is a creamy and fruity shake. 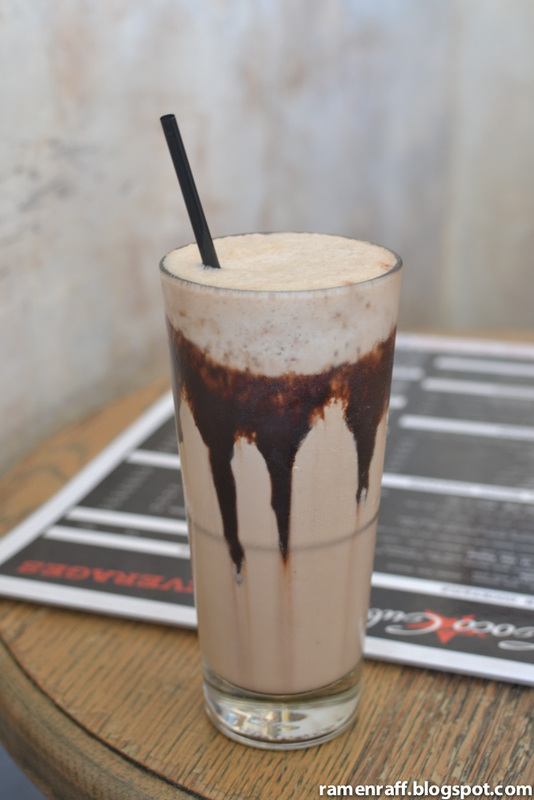 The vanilla ice cream is used in the shake. I feel like going to my nearest EasyWay now after all that talk about their new range of milk teas and shakes! Why not head to your nearby EasyWay store and get refreshed with their Fruit Pulp Party II drinks! 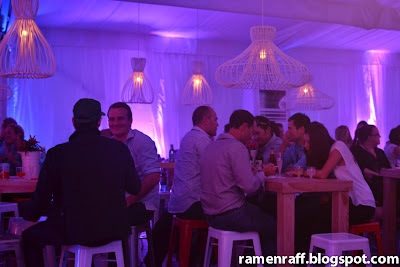 Ramen Raff was invited by Katheryn and Nicholas of EasyWay to try out the Fruit Pulp Party II range.